Off late, I find myself making a lot of hot potch dishes especially with left overs be it fried rice or bread upma. Remember the Parotta recipe I posted last week? 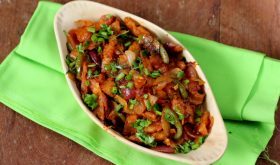 I had quite a few parottas sitting in the fridge that I put to good use by making Kothu Parotta and Chilli Parotta, both of which are popular street food fares of Tamil Nadu. There are a few variations of restaurant style Chilli Parotta according to the region it is prepared. A very popular version involves cutting the flaky parottas into bite sized pieces, dipping them in a thin batter of spiced flour and cornflour and deep fried till crisp before being tossed in a coconut based gravy consisting of onions, caspicum and spices. 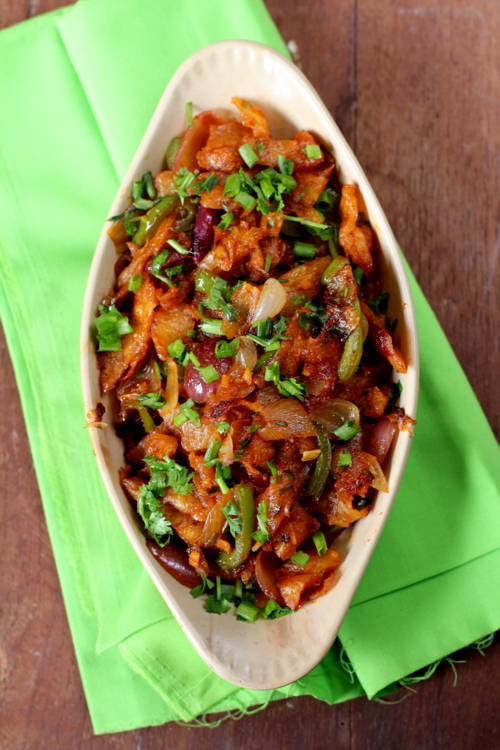 There are no ‘rules’ to be followed for street food fare like Chilli Parotta recipe. It is versatile, in the sense one can add ingredients be it spices or sauces according to one’s preference. A simple twist can transform the dish’s texture and flavor profile and make it something special. Tear the parottas or chapatis into bite sized pieces or alternately cut them into strips using a knife. Set aside. Heat a heavy bottomed vessel, add oil and once its hot, add the minced garlic and saute on high flame for a few seconds. Add the minced ginger, green chilies and onions and saute on high flame for 3 mts before adding the sliced capsicum. Saute on high flame for another 3 mts. Add red chili powder, garam masala powder, soy sauce, tomato sauce and salt to taste. Mix well. Saute on high for a mt, tossing the contents well so that they do not burn. Add the shredded parotta and continue to roast on high flame, tossing the contents such that the spices and sauce coat well. Toss on high flame for a mt. Finally add the lemon juice and mix. Turn off flame. Remove to a serving bowl and garnish with spring onion greens and coriander leaves and lemon juice. You can add a dash of black pepper powder to a spicy kick. The same recipe can be made into chilli egg parotta. Lightly beat 2 eggs with a dash of salt and add this mixture after Step 2. Make a well in the center of the vessel and add the egg mixture and scramble it lightly. Cook for a mt and mix the contents well. Follow rest of the recipe. Roasted cashew nuts can also be added. By Sailu Published: December 22, 2013 Chilli Parotta , a classic street food popular in Tamil Nadu, is made with shredded Parotta, capsicum & sauces. Learn how to make Chilli Parotta recipe. Do you deep fry the roti/parottas first? Don’t the rotis get soggy with the sauces? !Came out really good 🙂 Thanks for sharing! This is one of the best recipe i ever read in recent times. Can I make these with freshly made rotis too ?